Fred O Smith (left) and Glenn Kapiloff (right). FARMINGTON - Fred O Smith was sitting on a rickety stool in Old Ford Antiques in Farmington, Maine when the stories began. First, it was about his father, who was a past president of the Farmington Rotary. It was he who taught Fred O about service and about the power of Rotary to change lives. So much so, in fact, that after he joined Rotary in 1966 and balanced life in the military with attending Rotary, when he learned that his father had not missed a Rotary meeting in 10 years he said, “well, I can do that, that is an admirable goal.” After the 10-year goal was met, Fred O never stopped, and in 43 years Fred O has never missed a meeting. 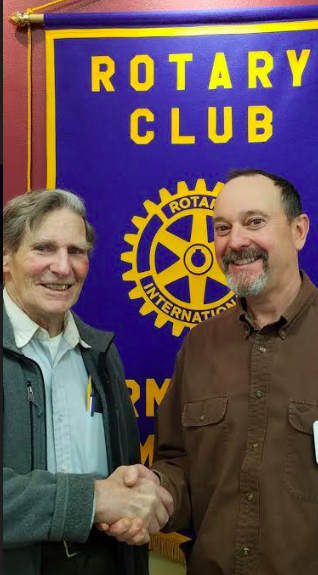 This is a milestone to celebrate as this energetic and enigmatic 84-year-old assumes the presidency of the Farmington Rotary club a half a century after his father assumed the reins. Fred O’s father was an inspiration not only because he joined Rotary, but because he was an independent thinker, Fred O noted as he acknowledged a customer coming through the door. “My father taught me to embrace differences saying, I may not agree with you, but I defend your right to your opinion.” This viewpoint has served Fred O well in his professional and civic life. Fred O joined the small town New Vineyard Fire Department, which is adjacent to Farmington, in 1961 and continues to this day to serve this community admirably as an active firefighter. He is currently historian of the American Legion. He is an active member of Old South Congregational Church. He is currently a deacon of the church, property trustee, representative to the Farmington Ecumenical Ministry, and past moderator and current Vice Moderator. Fred O is a member of the Farmington Zoning Board and Budget Committee. He is in his 21st year on the Maine Republican State Committee. He is a board member of the Porter Lake Association. Fred O is perhaps most proud of his military service. He served active duty in the US Navy from 1956-1960 and Reserves until 1979, rising to the rank of Lieutenant Commander where he was recognized with medals including the Armed Forces Expeditionary Medal. Fred O graduated from prestigious Bowdoin College in Maine in 1956 with a degree in history and government. His passion for education was demonstrated when he obtained his masters from the University of Vermont in Political Science when he was 65 years old. While education and service were ever present during Fred O’s formative years, his head for business brought him to work in the wood turning business. This was a natural sector for him to explore as he grew up surrounded by woods and worked in his father’s wood turning mill. As Fred O reminisced about growing a thriving wood turning business, he became whistful when he talked about the effect of plastic on the industry and foreign imports as well. The mill burned twice and finally, Fred O left the industry, although wood is still in his DNA as he began woodworking after the second fire and has not stopped. He creates beautiful custom-made jelly cupboards, and hutches which he sells at craft fairs and in galleries throughout the region. Fred O and his wife Mable had three children and eight grandchildren. When asked why he joined Rotary, the room got quiet. He paused and then said, Rotary is a great group of professional people that believe in service. There is camaraderie and Rotary is inspiring youth – our future. He is particularly excited to note that the Farmington Rotary Club may be the only club in the world that has active youth clubs in every level: Early Act (Elementary); Next Act (Later Elementary); Impact (Middle School); Interact (High School); and Rotaract (College). In addition to the camaraderie and youth development, Fred O noted that Rotary is an organization where you get things done. For example, Rotary has invested heavily in eradicating polio, ensuring clean water throughout the world and so much more. As Rotarians inspire youth, Fred O inspires all. Most who are approaching 90 would be slowing down and enjoying more restful times, but as he gets up to greet a customer I can see it is simply not in his nature. No one more committed then Fred O. Now you've done it, Fred! Conratulations!! I'm very happy for you.